Home but don't want to spend time in the kitchen? 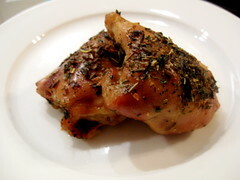 Try these easy to make chicken thighs. I had these at our good family friends', the Seznec's, one summer evening with salad, crab cakes, asparagus and fresh bread. Everything was seasoned delicately and was delicious! Aunt Thackray's a native of the Maryland seashore, and her husband Uncle Jean-Francois, well, you guessed it, he's French. Needless to say there was both Maryland seaside and French inspiration in our meal. I enjoyed the entire meal, and later asked for a few of Aunt Thackray's recipes. 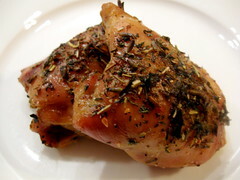 This chicken recipe seemed like the easiest one to try, and sure enough, it was a cinch. 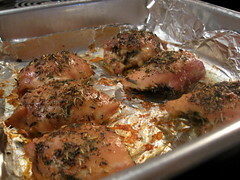 My husband and I ate this chicken with a big salad with homemade vinaigrette dressing, but it would go nicely with other things such as zucchini and roast potatoes, or haricot verts and rice pilaf. This is delicious and cute ! I like this simple recipe. It’s so easy to make. Thanks for sharing. I love this delicious recipe. It’s tempting me to try out today itself. Thanks for sharing. sell used cars in Chanakyapuri – We are one of the best auto portals in India, provide best price on the second-hand cars in Chanakyapuri, Delhi. Upload your second-hand cars and get the reliable price according to your choice.